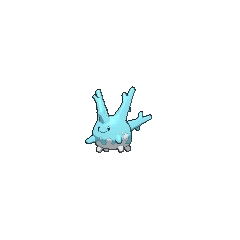 Corsola in game: 2,616 Who? Important notice! 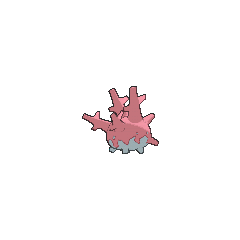 Pokemon Corsola is a fictional character of humans. Corsola is a small, pink, roundish Pokémon with branch-like growths on its back, which are similar to coral. There is a smaller, blunt horn on its forehead, and it has black, oval eyes. It has a white underside, which speckles towards the sides. Its four legs and two arms are blunt and stubby. Found in the warm shallow waters of southern seas, Corsola requires clean water to live. If its habitat is dirty, the growths on its back become discolored and degenerate. However, when it is healthy, its growths regularly shed and grow back. It is able to regrow them over the course of a single night. It forms large social groups. Occasionally these groups get so large that people may live atop them, as is the case in Pacifidlog Town. Mareanie is a natural predator of Corsola. Misty has a Corsola she caught in the Whirl Islands in A Corsola Caper!. It wandered into a group of Corsola raised by a family living in Yellow Rock Isle. 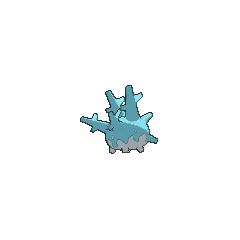 It caused trouble for them as it was very energetic and tackled all the Corsola, scaring them away. Things were solved when Misty battled and caught the Coral Pokémon. 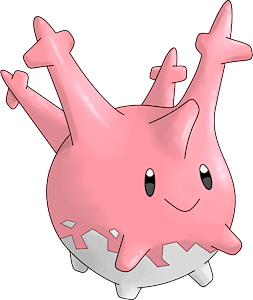 Corsola made its debut appearance in the main series in Around the Whirlpool under the ownership of Professor Elm. A Corsola made a cameo appearance in Going for the Gold!, in which Serena failed in capturing it. Five wild Corsola appeared in SM012. Corsola's debut appearance was in Pikachu's PikaBoo. Misty started her little speech about being the best Water Pokémon Trainer after she spotted four Corsola in Fly Me to the Moon. A Corsola appeared in Takin' It on the Chinchou where it was standing on a wave barrier. A Corsola was used by one of the students of the Pokémon Trainer's School in Gonna Rule The School!. Multiple Corsola also appeared in Pokémon Ranger and the Temple of the Sea. A Corsola belonging to a Coordinator appeared in Dressed for Jess Success! participating in the Battle Stage of the Lilypad Contest. A Coordinator's Corsola appeared in Yes in Dee Dee, It's Dawn! participating in a Double Performance along with a Hitmontop during the Daybreak Contest. A Corsola appeared in The Guardian's Challenge! and SM006. Three Corsola appeared in SM005, with two being wild and one appearing in a fantasy. A herd of Corsola appeared in Off Course with Corsola where they weighed down Lt. Surge's miniature submarine. However, Crystal, who had been accidentally kidnapped into the submarine, used her capturing skills to free the submarine from the Corsola. Corsola is the lightest Rock-type Pokémon.